In the 1960’s there was a plan devised by the U.S. Government to have in place a conspiracy of denial with regards to the possibility that a new space program would discover the possibility of life elsewhere in the universe. This plan, provided by the Brookings Institute, was completed in December of 1960 and pointed out the very real fear of social disintegration if humanity discovered in its cosmic sojourn proof of extra-terrestrial life. Needless to say the guardians of intelligence suggested that if the U.S. space program found evidence of alien life or technology that it would be advisable to withhold that information. Nearly five decades later, much of what the Brookings Institute laid out for the space program still holds and science is still in the act of denial of any intelligent life in space. Since the Curiosity Rover landed on the surface Mars , there have been a number of curious anomalies being sent back to earth that have created all sort of buzz on the Internet. Observers have seen anything from strange human looking statues on Mars, to strange lights beaming up from the surface and of course various Unidentified flying objects that come and go and are recorded. NASA has done its best to explain that what is being seen is some sort of lens flare or pareidolia much like was done at the time that curious mars watchers saw a face in the Cydonia region of Mars. In an email published by The Virtually Strange Network, “Brookings Report Re-examined,” Keith Woodard writes that the Brookings Report “did raise the possibility of withholding information, but took no position on its advisability. ‘Questions one might wish to answer by such studies,’ intoned the report, ‘would include: how might such information, under what circumstances, be presented to or withheld from the public for what ends? It was after the Hurricane Katrina Disaster that George W. Bush announced that United States was once again preparing to go to the moon and then explore Mars. It was a One hundred and four billion dollar plan to get men back on the Moon by 2015. The next challenge would be Mars in 2015. In the meantime there were private companies asking people to take part in experiments to see if the average human could withstand and or participate in a Mars expedition. There were even all sorts of polls taken where people would volunteer to go to mars and not return. The Netherlands-based nonprofit Mars One, which aims to establish a Red Planet settlement beginning in 2025, announced that it had sliced its pool of potential colonists from 1,058 down to 705. The remaining astronaut candidates now advance to an interview round with Mars One’s selection committee. With all of the anomalous coincidences there has always been the question in the back of a few people’s minds as to whether or not off planet settlements exist or if our Military have secretly established small bases or scout encampments on the Moon or even on Mars. There have been plenty of weird statements by Astronauts and others about how the space program is neglecting its responsibility to Mars. Which once again is curious because the Mars Rover and the saucer experiments. Apollo Astronaut Buzz Aldrin has mentioned many times about anomalous artifacts found on Phobos including a monolith structure, and how a settlement on mars should be led by the United States and that historians will record our success in leaving earth for mars sooner than later. When Hacker Gary McKinnon breached security on a so called “secure” NASA computer network he happened to hack into a series of computers in the Pentagon, NASA, and other sensitive military locations. McKinnon claimed he was seeking information on UFOs and says he found files dealing with “non-terrestrial officers” and “fleet-to-fleet transfers” involving ships not on any U.S. Navy registry. This story makes us wonder if we are being told everything about what is going on above us. The McKinnon story is just one of the many that provide circumstantial evidence which points to the possibility that there are secret weapons and stations above us in space and possible settlements or micro bases on either the moon or Mars. NASA is a military installation claiming to be civilian. The billions of dollars going to “philanthropic space programs” are mostly funneling into the military industrial complex. Sure there are missions to send probes out in space. But the real reason for NASA is to research the idea of using space as the new battlefield. The dreams get the good press but the nightmares are performed in secret. You may not believe in Aliens, but it is evident that space agencies around the world do and that the United States Military, NASA and other black ops organizations have sensitive information that they have kept from the American people regarding strange anomalous activities in space. It is getting to the point where NASA is no longer capable of keeping everything “top secret.” Some things cannot easily be explained by science. NASA is finding it harder to hide the truth about an “alien” presence on earth and in the solar system. They are also finding it harder to hide the fact that perhaps they have kept under wraps secret space missions and off world battalions that may have secret bases either on the moon or even Mars. Now I know at first that the idea of a secret space port or even a settlement on Mars or the moon sound outrageous, but just before Barack Obama cut funding for some of the more challenging space projects many astronauts and other were kind of hinting at the idea that NASA is not telling the truth about what is above us in space. The most “earthlike” planet in terms of gravity and distance from the sun, Mars has long been considered the best bet for extraterrestrial life and the possibility of a settlement of humans living on the red planet. I am sure many of us are familiar with William Cooper. He is the well known former U.S. Naval Intelligence officer that shot by police officers in 2001. He is the author of the book Behold a pale Horse. In Bill Cooper’s 1989 lecture and affidavit, he states that the U.S had first landed on Mars on May 22, 1962 and that, by the time the U.S./NASA public space program landed on the moon in 1969, the U.S. already had a moon base there, since the mid-1950s..
Well, if you believe William Cooper, then perhaps it is not much of stretch to announce that a new whistleblower has stepped forward and has made the claim that he served in a military capacity on Mars and that he has done so for 17 years. 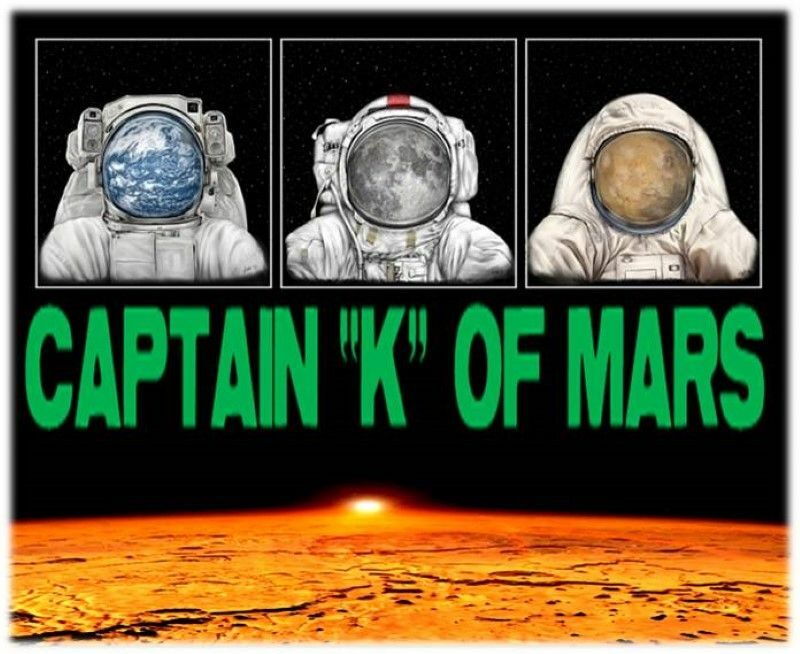 An former active duty -marine using the Pseudonym “Captain Kaye” claims that he spent 17 years on Mars serving at a secret military base whose main mission was to protect five civilian space colonies Kaye claims that he served with the Mars Defense Force and that they recruit personnel from different military services for off earth activity. He claims that there are two indigenous species on Mars, both of which are highly intelligent. One of these was a Reptilian species that was very aggressive in defending its territory. The other was an Insectoid species that was equally capable of protecting its territory. He said that indigenous Martians are not particularly interested in expanding their territory, only maintaining it. Captain Kaye said that as long as the Mars Defense Force and Mars Colony Corporation did not encroach on the territory of the indigenous Martians, there would be stable relations. Captain Kay first made his case and reported his experiences to Dr. Michael Salla of Exo-politics. Kaye reported to Salla that after serving 17 years of a 20 year tour of duty, events changed dramatically when virtually all combat personnel from the Mars Defense force were asked to retrieve an extraterrestrial artifact from a cave sacred to the indigenous Reptilians. Captain Kaye described how over 1000 men and women were killed in a subsequent battle and only 28 of his colleagues, including himself, survived. It is important to understand that there have been others who also have made claims of being used for experiments in a simulated Martian environment that has affected them psychologically. There have been claims by Andrew D. Basagio and Arthur Neumann, that they were part of experiments that placed them on mars working with extraterrestrial beings. Apart from the outrageous claims of these possible Martian astronauts are recent experiments that NASA has conducted for future visits to Mars. NASA successfully launched and recovered a “flying saucer” into Earth’s atmosphere to test technology that could be used to aid astronauts working on the planet. The experiment off the coast of the Hawaiian island of Kauai tested the disc-shaped vehicle and a giant parachute. The parachute did not fully deploy but NASA still deemed the mission a success. The ‘flying saucer’ splashed down in Pacific. Dr. Tom Van Flandern has argued for many years that mankind and science should always keep an open mind when it comes to Mars. We see a lot of people who claim to be scientists or claim to be skeptics, and yet in the same breath become unscientific, rigid, and malicious. They throw insults at people who have imaginations. They laugh at people who see faces in Martian soil, and artificial structures. They laugh at those who wonder about microbial life forms on the planet. They belittle those who speculate. However, how are we supposed to react to those who claim to be part of secret space programs where we may already have bases planted in the regolith of the moon or the red soil of Mars? In a free and open society where communication spreads as fast as one can hit enter on a keyboard mankind goes from rudimentary space explorers to fully fledged pioneers into the final frontier. If we intend to live on Mars, and stay there permanently, we’ll be leaning hard on our technology to keep us alive. However that may all change because there are always those who came before us that have said , we have been there , done that and now it is time to go back and show that living on Mars is not as bad as we have thought. Perhaps we will have to change ourselves to adapt to what Mars has to offer.